The EC-US agreement contains a positive step forward from a regulatory point of view, be it that it is to be hoped that more attention will be paid to the convergence of competition law regimes. In this contribution, Pablo Mendes the Leon discusses new measures designed to arrive at liberalisation in the airline sector, particularly the establishment of an Open Aviation Area in the transatlantic market. Liberalization of air traffic in both the US and Europe has resulted in distinct patterns of spatial concentration of traffic distribution on each of the continents. This paper aims to account for geopolitically induced differences that can be stressed when comparing traffic distributions across continents. The research findings show important and potentially far-reaching asymmetries between (Western) Europe and the US for most of the geo-political dimensions. The news of low cost airlines’ success in Europe inundate our media continuously: more number of passengers, a higher turnover and an increased profit rate are noticed compared to the previous years. Research institutions as well as scientific magazines show their interest in this topic by providing a large number of studies and articles about the operating features and future perspectives of low cost airlines. Low cost air travel has not been existing for some years only. With the ‘US Airline Deregulation Act’ in 1978, the skies in the United States have been deregulated now for more than 20 years. So-called ‘liberalisation’ of the European transport market took place in 1993 with the introduction of the ‘third package’ that made free pricing and full cabotage possible. In Continental-Europe, low cost air travel became very popular recently with a huge number of start-ups in 2002. 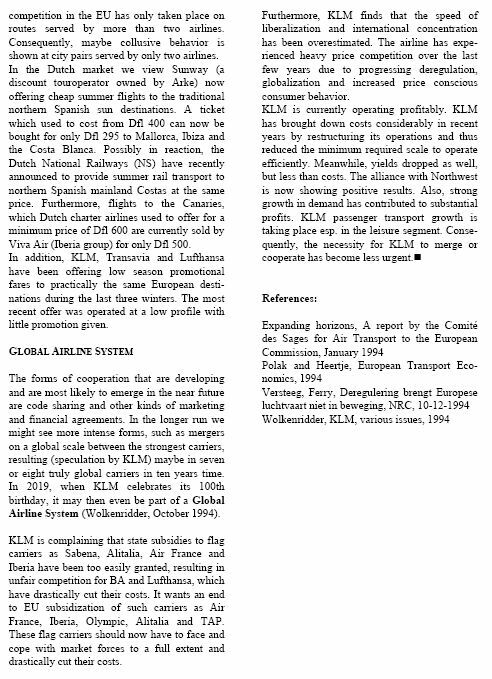 Theories about future growth of low cost airlines predict that in the medium term they will be able to enlarge their results, but in the long term they will not be able to take away crucial shares of the market from the incumbents. As low cost airlines sell tickets at low costs, they also have to ‘produce’ at low costs which means they have to save money wherever possible. One important instrument for reducing costs is by flying to small, so-called ‘secondary airports’ that are situated close to conurbations or major hubs of traditional airlines. These airports charge less or nothing, because they expect their non-aeronautical revenue to increase from the enhanced number of passengers. Additionally, there is a potential for the regional economy around these airports to benefit from these passengers. However, more traffic also means that facilities have to be adapted or enlarged. This concerns the airport and the service providers in the regions. There is no guarantee for future return if the airline exits the market or ceases operation. Taking the example of the Frankfurt-Hahn Airport and the Hunsrück region, the author analysis the changes in terms of number of passengers / guests, companies / employment and investments, and evaluates if low cost airlines are a substantial chance for the airport and the region.